We arrived in Verona, Italy after a few hours drive from Milan. We were ready to stretch our legs, but most of all we were eager to experience this symbol of Italian charm and romance. We kept using the promise of Italian ice cream as a bribe for our kids as we started exploring this beautiful medieval city. Read on to experience my charming walking tour of Verona, Italy. What can you expect when visiting Verona, Italy? We arrived in Verona after walking through Milan the previous day. Since we were a bit tired from our drive from Milan, we were eager to stretch our legs and enjoy this beautiful medieval city. Based on our research we expected a medieval town with old walls and buildings. 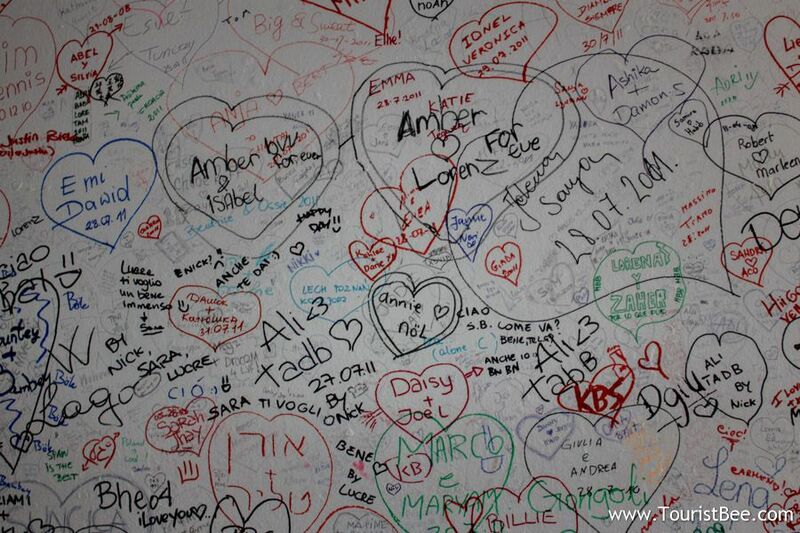 This is what we actually found, but Verona gave us much more than what we expected. So come along with me on a charming walking tour of Verona, Italy. We were surprised somewhat that Verona’s old town was a much larger medieval town with a lot more historical attractions, shopping and restaurants. See my photos from Verona. After lots of research prior to coming to Verona, I had a short list of things to see. Over the years I have developed, a very efficient trip planning strategy. This way I make sure our expectations match what our destination can offer. Our visit to Verona was more difficult because we only had a few hours available on our way to Venice. So we had to have a precise list and efficient logistics so that we won’t waste any of our limited time. Fortunately, we did have a good plan and we enjoyed our time in Verona, Italy. Piazza Bra and the Roman amphitheater are the first attractions you will most likely see in Verona if you enter the town through Porta Nova. They are both worthwhile attractions and it’s worth your time to not rush through them. 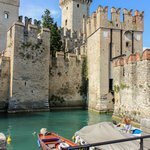 Castelvecchio is a beautiful medieval castle on your left as you look at the Roman Amphitheater. It’s worth walking over the old bridge and walls and enjoy the beautiful views of the Adige River. Via Mazzini and Piazza Dele Erbe are usually filled with tourists because Via Mazzini is the main shopping area in Verona and it leads to the beautiful medieval Piazza Dele Erbe. Walk on Ponte Pietra and enjoy the the beautiful views of the town and surrounding Hills. 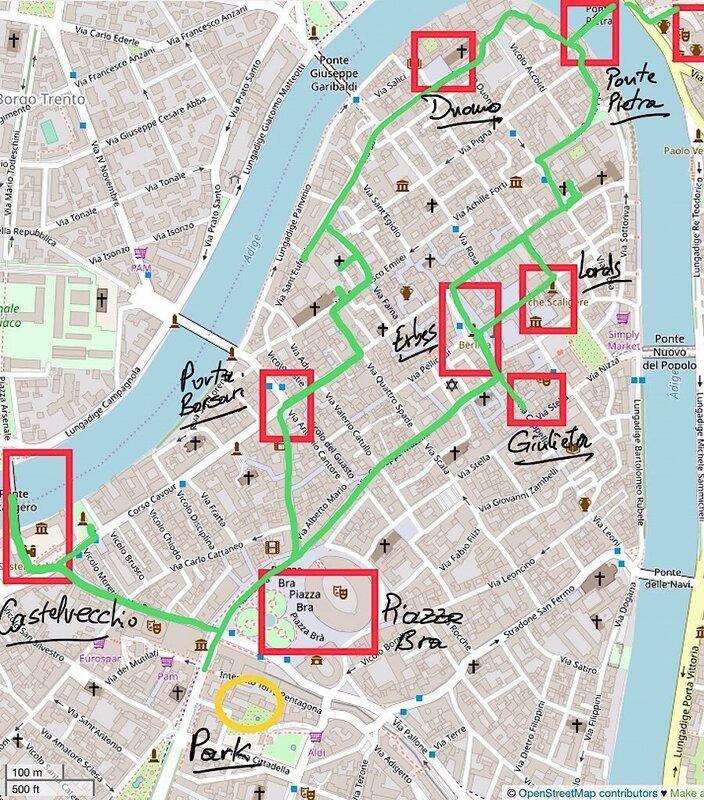 With the list of tourist attractions and a map in our hands we started exploring Verona on foot. So, come along with me on my walking tour of Verona, Italy. 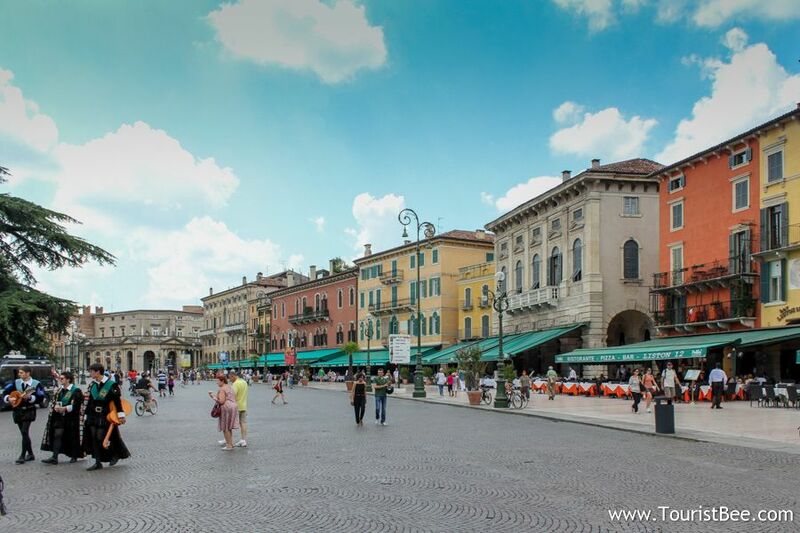 Piazza Bra is a beautiful place to start our walking tour of Verona, Italy. After parking our car, we walked through the arched Porta Nuova right into the large Piazza Bra with the large Roman Amphitheater dominating the square. This is a striking place with many attractions for your eyes: there is the large Roman ruins, the beautiful earthy colored buildings and the small park with the water fountain in the middle. So, we lingered around for a while before going left towards Castelvecchio. The second stop on our walking tour of Verona is Castelvecchio which simply means the Old Castle. It is located immediately to the left as you enter Piazza Bra. 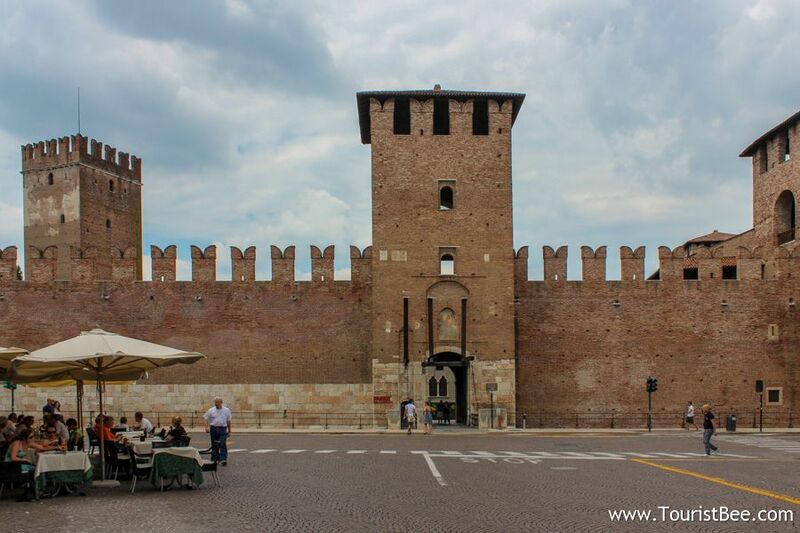 A short side street takes us to the imposing Castelvecchio which currently houses the History Museum of the Verona region. You don’t have to visit the museum in order to enjoy the old walls of Castelvecchio. Just walk through the museum courtyard and walk on the old castle walls. 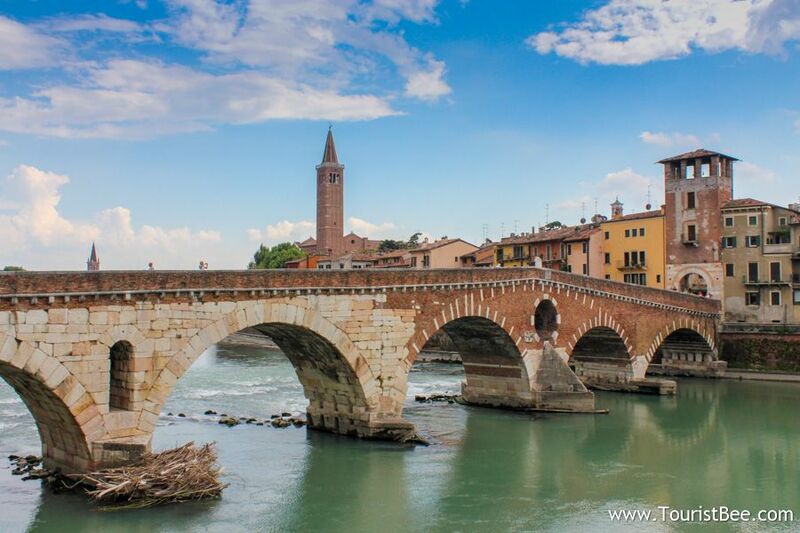 About half way, you will get beautiful views of River Adige as it meanders around the old town of Verona. This is a great place to take great travel photos. Walking back to Piazza Bra, we will stop at the imposing Roman Arena. This is the second largest Roman Amphitheater after the Colloseum in Rome. 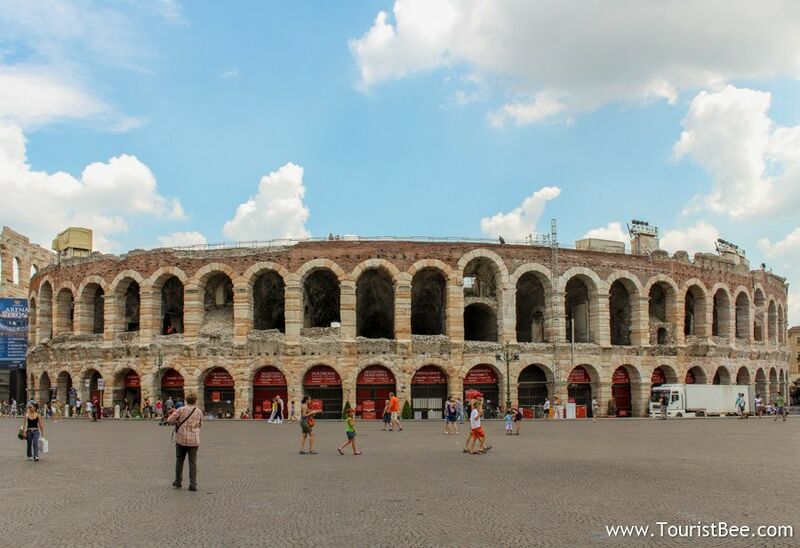 During the summer, the Roman Arena in Verona hosts many opera and music performances. So, if you have time to attend in the evening, these concerts are amazing not only because of the great historical setting but also because of amazing performers. Continuing our walking tour of Verona, we follow the crowds along Via Giuseppe Mazzini, which is filled with beautiful tourist shops and will lead us to Juliet’s House and Piaza dele Erbe. At the end of Via Mazzini we come across Via Capello, and we go right and follow the crowds to our fourth stop on our walking tour of Verona. We come to the place that made Verona famous. Verona is most famous for being the setting for Shakespeare’s Romeo and Juliet play. Juliet’s House is such a popular attraction that it is very difficult to actually go in the small courtyard and visit the place. During the summer, when we visited Verona there was an impossible number of tourists inside the small courtyard at Juliet’s house. Unfortunately we were only able to look around a little bit. From Juliet’s House we go back on Via Capello we arrive shortly in Piazza dele Erbe where everything seemed to be moving. This is my favorite stop on our walking tour of Verona. There were so many people resting at small cafes and restaurants or browsing the small market in the middle of the square. Piazza dele Erbe is great longer stop where you can rest a little and have a yummy snack at one of the many cafes. Lamberti Tower is the tall building that dominates the square. It is an impressive tower, with very complex and beautiful ornaments. The Verona Cathedral is the old church in the north of old town Verona . 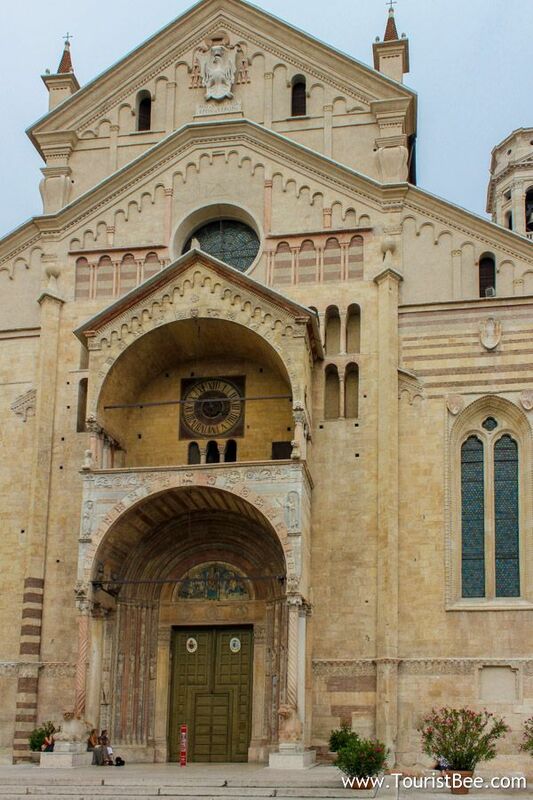 Built in the 12th century, the Verona Cathedral has a concentration of early Renaissance art and architecture. 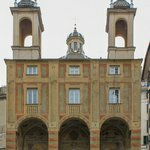 It is a great stop on our walking tour of Verona because it gives us time to go slow and actually think about these really old places. From Duomo di Verona we followed some of the larger streets and came out from the old city on Ponte Pietra. This is one beautiful and old bridge that gives you great views of the city and surrounding hills. Old medieval towns like Verona had their defenses split between the various regions on the town. Each region had their own entrance gate and they were responsible for defending it. Borsari were the old bag makers who were skilled leather workers. Our last stop on our walking tour of Verona is Porta dei Borsari. 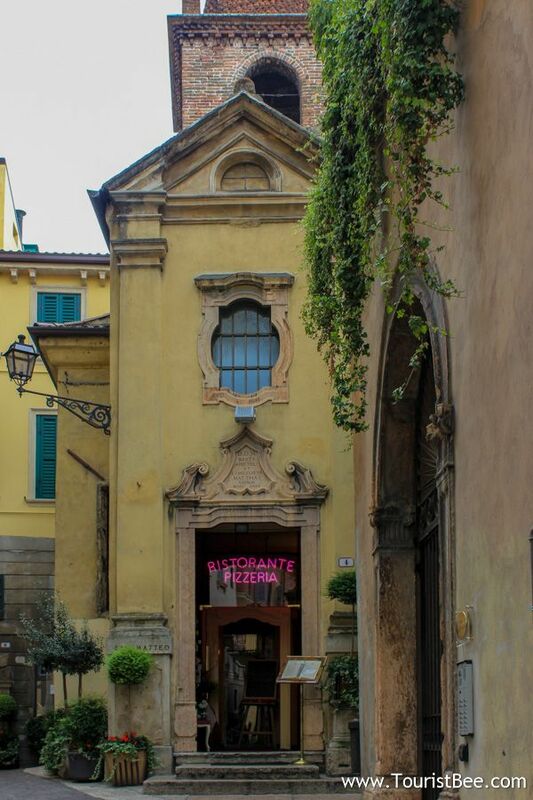 The beautiful San Matteo Church restaurant and pizzeria is located behind Porta dei Borsari. Verona is filled with old medieval buildings that quickly take you back in time. If you stray from the crowds of tourists and wonder the small narrow streets you will find architectural gems and much Italian charm. Is it worth visiting Verona, Italy? Absolutely! Unfortunately we were only able to spend about five hours visiting Verona, Italy. We wished we had more time to explore more in depth. 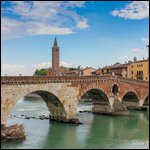 Verona is full of Italian charm, history and you can easily walk everywhere in old town Verona. You can easily spend two full days taking your time to enjoy this beautiful old town. Find budget hotels in Verona. 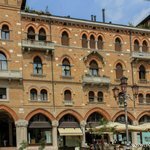 If you planning to visit this beautiful area and you want to spend more time in Verona, you can find plenty of budget accommodations for every budget. Find a local Verona walking or skip-the-line museum tickets. 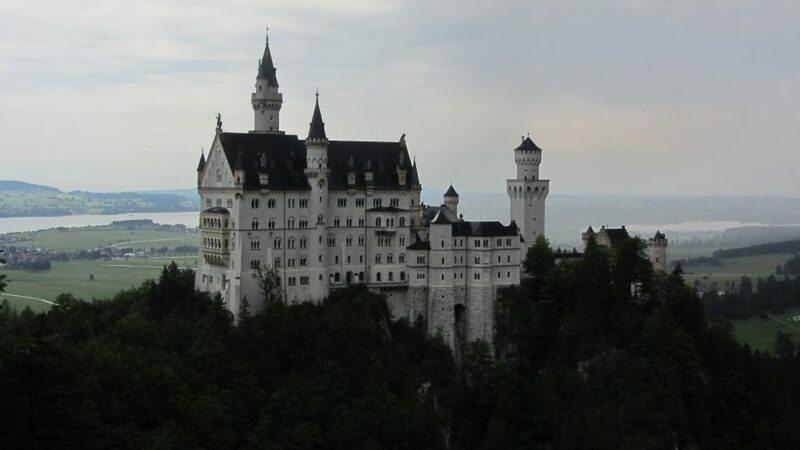 Many local tours are available in and around Verona as well as museums and entertainment venues. Finding parking in Verona was tricky for us because our Garmin GPS led us to enter the town the wrong way. We arrived in Verona from Milan with our Italian rental car. The drive from Milan to Verona takes about 2 hours on the fast A4 freeway. Our GPS led us through a very narrow street that ended with a small restaurant. After asking for directions in my broken Italian, we had to come all the way around the city to Porta Nova where a modern, large and multi-leveled parking structure waited for us. Click here to see the Verona parking lot entrance map. Or, if you’re looking for the actual address here it is: Piazza Cittadella, 5/A, 37122 Verona VR, Italy. 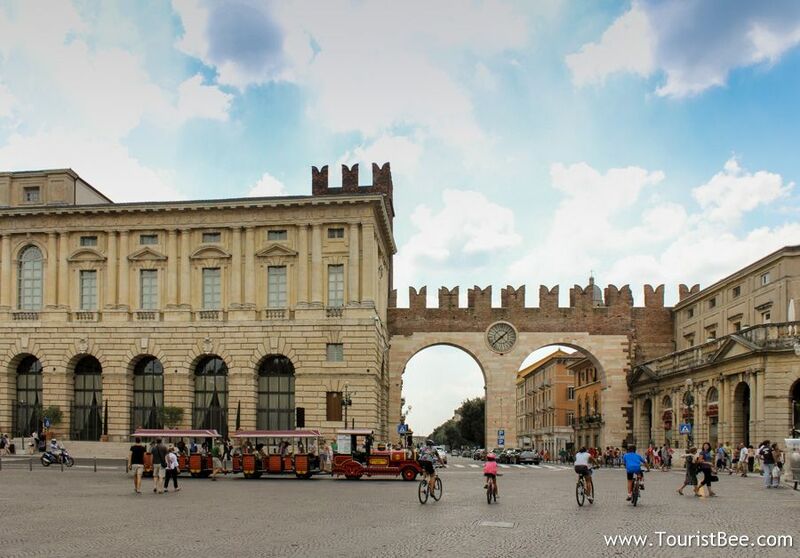 From the parking lot, it’s only five minutes walk to Porta Nuova entrance to the old Verona. How about you? Have you visited Verona, Italy? What was your own experience visiting this city? Leave a comment below. This charming walking tour of Verona is part of my 1 week tour of Northern Italy. Thanks for this. I will be using it to plan a day in Verona. We are taking the train from Venice after a cruise and looking for a day trip. I think this is the one! 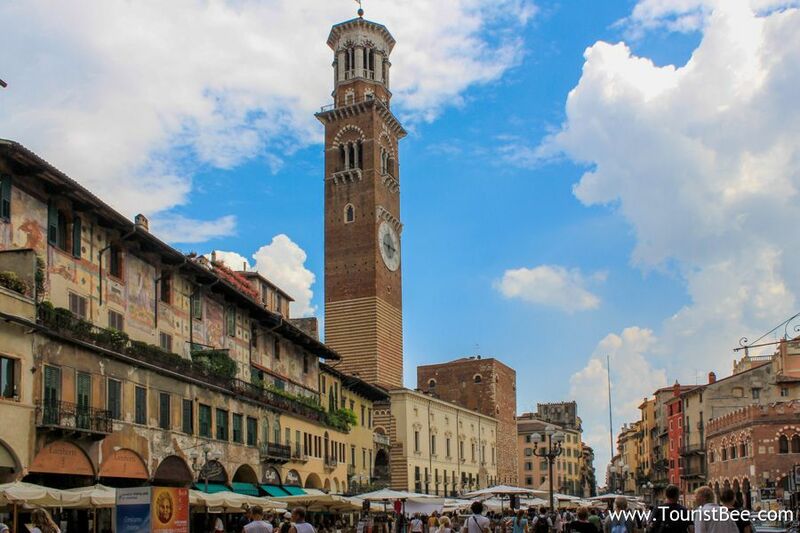 Kathleen…Verona is a great day trip from Venice. You will love it! It’s about 20 minutes walk from the train station to the Roman Arena which is right in Piazza Bra. Make sure you also go left from there to see Castelvecchio and River Adige. Let me know how it went! Thanks! We go in October but I will let you know! thanks for this – I used your guide as a template for a wonderful afternoon in Verona. We took in most of your sights and loved it. 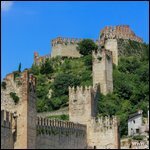 Great to hear my article on Verona was helpful to you!